More Chocorooms! This time I have purple sweet Potato with white chocolate and black sesame seeds! After trying the original, reviewed here, my sister was eager to try more! She loves this line! (It’s so cute!) I picked up a few flavors, so soon you’ll see reviews on strawberry and butterscotch soon! The box is bright and eye catching. 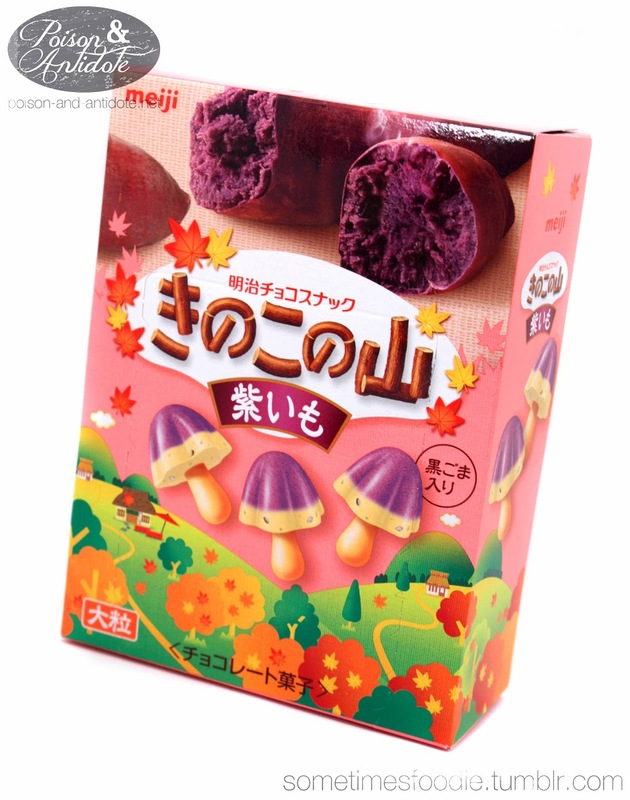 Judging from the image, I am guessing roasted sweet potatoes are a fall treat in Japan. There seems to be a fall theme to the box with leaves being Autumn colors. 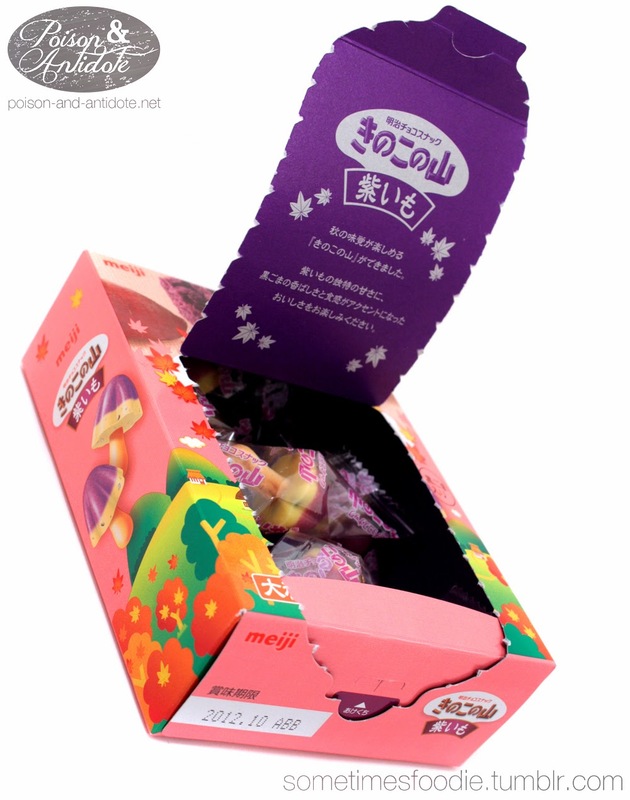 The package opens in the front, a lot like the Meltykiss Almonds I reviewed the other day, but the layout is arranged around the perforations so when I do open the box the design isn’t destroyed.I like that a lot! 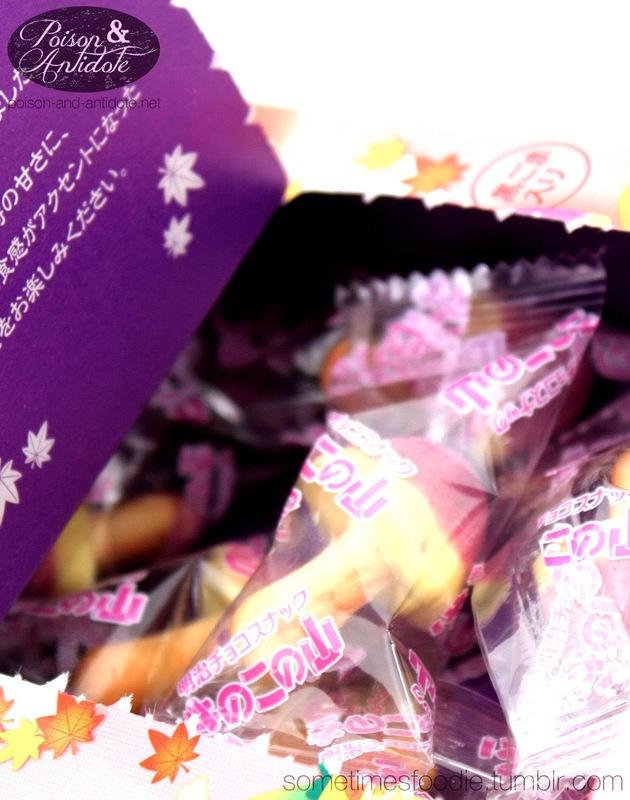 Inside are individually wrapped little ‘mushrooms.’ Each one has a purple, taro, top and a white chocolate bottom. The white chocolate is mixed with black sesame seeds. 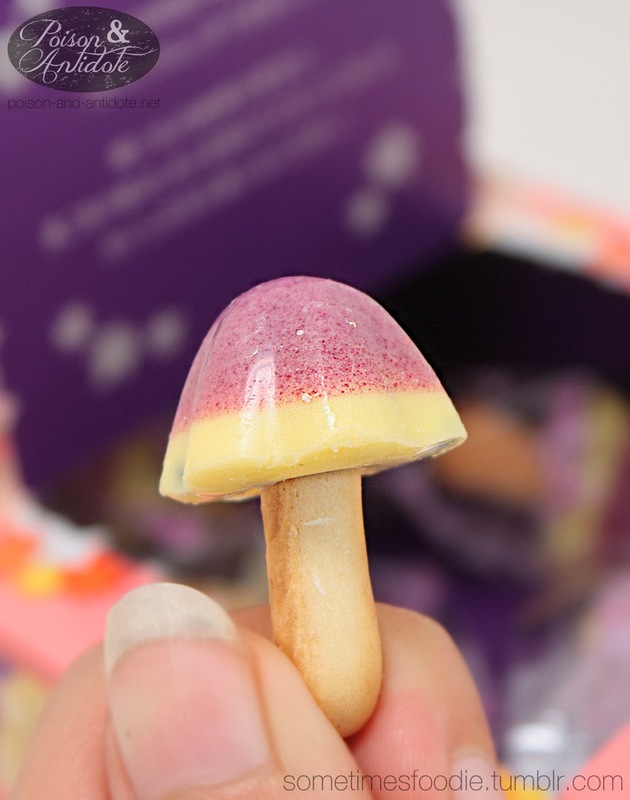 It has the same biscuit stick as original Chocorooms. Once I open the individual wrapper, I smell very strong white chocolate. There is a slight hint of sweet potato, but it is lost in the white chocolate. Sadly, I think the white chocolate over powers a lot of the other flavors too. I mostly taste white chocolate with a hint of black sesame. I can barely taste any sweet potato at all. The white chocolate is soft and almost fudge-y. and as you chew it melts away in your mouth. The biscuit tastes just like an un-coated Pocky stick. Overall these are nice, but they aren’t sweet potato. Unless you’re craving white chocolate, I’d avoid these.